A quick guide to Edinburgh. The hogwarts-esque Scottish capital! Scotland, that mysterious place that sits above England, it’s own country and with it’s own culture and fiercely proud spirit. It’s capital, Edinburgh, is an ancient city full of magnificent buildings make you feel as though you have stepped into the land of Hogwarts! It’s cobbled streets ring with the unmistakable sound of bagpipes and the dark and aged structures brought to life with splashes of colourful tartan! Edinburgh makes a great side trip from London (although, don’t forget to call in at Manchester on the way up and say Hi!) and can be done over a weekend. Here’s a quick guide! From London this distance is around 400miles and from Manchester it is just over 200miles. To drive it takes from London 7hrs and 30mins and from Manchester 3hr 44mins. A UK road trip is the ideal way to take in all the varied cities and landscapes of our home country. You can fly from London which takes just over an hour and cost between £50 to £100. The jewel in the crown of this magnificent castle it dominates the Edinburgh skyline and has done since the 12th century. It is an important piece of Scotland’s heritage and history and not only is it an impressive vantage point to visit but it chronicles much of that history through displays and museums inside. The castle famously sits on top of an extinct volcano, the position gave what became to be known as “the most besieged place in Great Britain and one of the most attacked in the world” a tactical advantage over advancing enemies. One of the highlights of the day is the firing of the cannon at one O’clock every day (except Sunday, Good Friday and Christmas Day). Now just used as a ceremonial signal it was first established in 1861 as a time signal for ships over 2miles away in the Firth of Forth and harbour of Leith. Allow 2-3 hours for your visit. The Scott memorial is the unmistakable 200ft tall Victorian Gothic tower standing just off Princes street in the heart of Edinburgh. 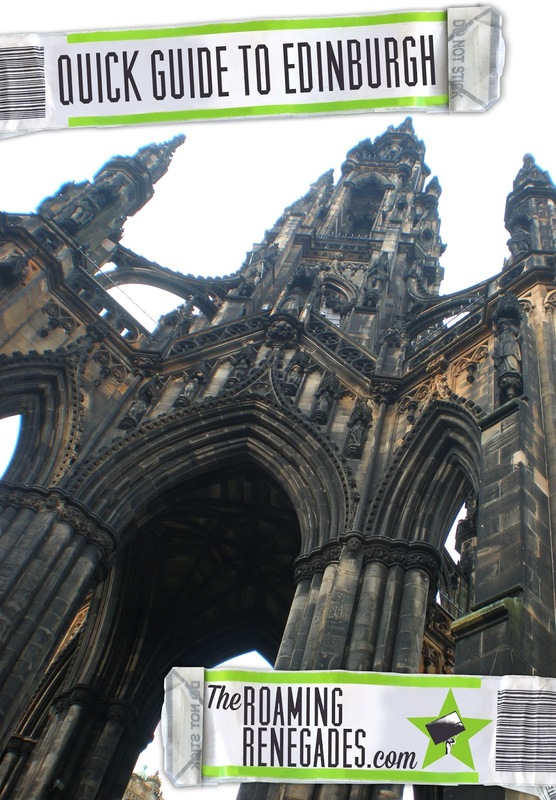 It memorialises the Scottish author Sir Walter Scott and for only a few pounds you can climb the 287 steps which reveal the amazing panoramic view of the city. Not only that but once at the top you are afforded an up close view of the artistic details of this powerful memorial carved in great detail from 1840 to 1844. You’ll even receive a certificate for your efforts, but the view alone is a worth while reward! One of the more off beat attractions but definitely the most fun! This crazy world of optical illusions will take you deep into the heart of Victorian Edinburgh where you will learn about the city as well as the mystical way our brains and eyes work! It’s an odd combination but it works, it’s like stepping back in time to a 19th century fair ground attraction! This is a great thing to do with kids in Scotland too as it’s such a fun place! This unique and fascinating attraction has been wowing locals and visitors alike for over 150 years…and don’t think it’s just for kids either! In this day of modern technology Camera Obscura proves how even simple mirror and lens tricks can still amaze! One of two main streets in Edinburgh the Royal Mile is by far the most historic as it runs through the centre of what is the old town of the city. Spanning a whole Scots mile (slightly longer than an English mile!!) it runs down hill from Edinburgh Castle to Holyrood Palace, two of the most historically significant buildings in Scotland. A stroll along here is guaranteed to be greeted by Bagpipers and copious amounts of kilts, but in a romantic sort of way, it’s just what you want from a trip to Scotland. There are numerous restaurants and shops to discover along here but if you are feeling a little more adventurous the nooks, crannies and side streets that lead off it. Also keep an eye out for the Heart of Midlothian and Canongate! The other main through fare of the city would be Princes street in the New Town area of Edinburgh. Unlike the narrow and romantic feel of the Royal Mile, Princes street is open on one side which allows views of the gardens, castle and old town. The street is home to more modern shops and is the city’s high street in all but name. Although still full of history the street doesn’t have the character and charm of The Royal Mile after several redevelopment projects but it does makes up for that in diversity of shops on offer and views over the city. It is also of course home to the Scott Memorial and the beautiful Princes street gardens and art gallery. The Palace of Holyrood house is the official residence of the British Monarch whilst in Scotland and fittingly sits at the bottom end of The Royal Mile and facing the Scottish Parliament. Since the 16th century Kings and Queens of Scotland have taken up residence here and the Queen still spends one week here at the beginning of every summer. Throughout the year it is possible to visit inside these impressive and historic apartments and gardens to take a look into the worlds of British and Scottish royalty. Just besides Holyrood Palace you will find “Arthurs Seat”, one of the highest peaks in mountainous Edinburgh. Like many of the cities hills and peaks it is an ancient and extinct volcano, in not many capital cities can you say that! The walk up to the top is an easy 20 minute stroll and offers great views over the city from yet another vantage point. The name is said to come from the legend surrounding Kind Arthur and is a great way to finish off the day…but be sure to take a rain coat, the weather in Scotland can be hit and miss! When in Scotland be sure to try some of the famous fudge available in Edinburgh, a bit of haggis with your breakfast and some Iron Bru to wash it all down! And of course pick up some world famous tartan and tweed! Also take note of the money, in Scotland they have the Scottish pound, this is a cool souvenir to take with you! Have you ever been to Edinburgh, what are your favourite things to do there? Bookmark this article A quick guide to Edinburgh. The hogwarts-esque Scottish capital!